If you are receiving spam submissions on your forms, a CAPTCHA is a great way to weed them out. A captcha requires a user to take an action (like clicking a button or entering text) that only a human is able to perform. 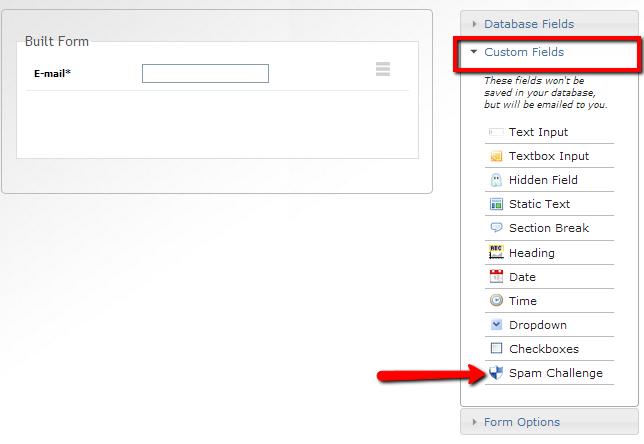 This stops spam scripts from being able to submit your form. This field will add a challenge question. Anyone attempting to submit this form must verify they are human by passing the challenge. If they do not pass the challenge, they will not be able to submit this form. How do I add my form on my Facebook page? How do I check up on the statistics on my form?